The World is growing at a rapid pace and for us to survive in it; we have to work hard to meet the expectations as required. Long hours of non-stop work and commuting, takes all energy out of you. Such life not only leaves you tired but also increases the stress and fatigue in your body. Always remember a happy life can only be achieved with a good health. Just having a massage chair at home will help you regain your strength, making you active all day long. Most modern treatments involve massage therapies and chiropractic adjustments. Here we share some benefits of massage chairs. A proper massage involves relieving the body’s muscle from stresses and hence reducing the fatigue built up. For health benefits, it’s deemed necessary that everyone once in a while, to maintain the body’s strength spends some time massaging the pressure points. The massage chair is designed to support your entire body in the best-relaxed position, tones your body relaxing the muscles and joints. The result of our busy lifestyle is reflected in the reduced healthiness of the body. Therefore it is necessary to increase the body health, preparing it to need the daily stress-load and the most common method is massaging.Where hectic work schedule is to be met, Powermax Fitness massage chair helps you maintain the fitness level. Spending few minutes in the massage chair will empower your body, relieving stress build-up. This will not only remove the tiredness of the day but will also prepare you to meet the energy demands required for the next day. A proper massage therapy also intertwines with the body’s blood circulation system. Having a robust circulation helps achieve an active life and also helps develop the immune system. Massage regulates the blood flow, increasing its rate and also the oxygen-carrying capacity to body parts. Increased blood flow also helps carry and remove the anti-oxidants that get accumulated in our body. In 2000, a research study relating to the blood pressure proved that regular massages treatments help maintain the blood pressure within limits, reduce the stress level and anxiety issues, which are the main causes of high blood pressure. The research study finally concluded that it is necessary to incorporate methods such as yoga, meditation, exercises and especially massages in our daily life. These will relax the muscles and our heart resulting in overall health betterment. Most people run after money. They work up to 14 hours a day, spending very little quality time and above all, completely neglect their health. All of us know “health is wealth”, but rarely very few of us follow the true purpose of the phase. To ensure our well-being, we have to eat healthy, leafy vegetables and do regular exercises. Massaging is also a good way to enhance our health and not to mention, it’s less time consuming and also enjoyable. For massaging purposes, newly available massage chairs from Powermax Fitness are perfect. These chairs are designed keeping in mind the body nervous and circulation system. Numerous massaging modes on these chairs, tone the pressure point all over the body. The body is a mirror and your age, a reflection of your health. In work, often busy schedules are encountered. This busy month of yours would have taken a significant toll on your health resulting in you aging faster than usual in that particular month. When our body is forced to work overtime, the power needed for that work comes out of our life expectancy. Such long over stressed periods accelerated the aging process. The result wrinkled skin, dark eyes, and dull face. For people who are so busy as mentioned above, try out the Powermax Fitness massage chair and spending just a few minutes on it will definitely do the trick. The stress that will get accumulated in the body will be relieved by the massage and will also boost your energy for the following day’s hard work. People suffer from many body aches, especially in the spinal region. Long hours of work or stressful sports sessions tend to stress out our body. The best solution for such problems is massaging treatments. All that is needed is a suitable massage chair and few minutes to spare. They press the pressure points accurately, removing the aches and minimizing the pain. Well, speaking honestly, most of our will find these types of treatment more suitable compared to taking painkillers and lots of other antibiotics. This also happens to be the most significant advantage of the Powermax Fitness massage chair- there is no way it can harm your body and also does not have any side effects. People trying chiropractic massage treatment often tend to get indulged in regular massage adjustments as they are able to feel the revitalization energy that this massage therapy brings. A serious yet unknown problem that all of us face is associated with bad posture. Spending hours, daily on the same work desk and at schools, bends our body always from the ideal posture. The effects of bad posture cannot be seen instantly but become apparent with age.Of all the body parts, the spinal cord is considering one of the most important and must always be taken care of. We all have seen old people back-bend and unable to stand up properly, all these shocking disabilities come with age and start with bad posture. Keeping this in mind, a lot of people start having regular massage therapy. If budget allows, buy a Powermax Fitness massage chair for home. Just spending few minutes regularly on the chair will help gain the body strength; enable us to counteract bad posture problems. Think of your body as a machine working for hours daily. It is natural like any machine; our body will also require maintenance and power to operate. Three things can be suggested for keeping our body in perfect working condition- healthy diet, proper sleep and body treatment like a regular massage. Consider massage chairs by Powermax Fitness as a life support system, by having it in your life you extend your lifeline. A proven study showed people having massage therapy have boosted energy levels, controlled anger and stable hormonal levels in the body. Keeping our busy work life aside, there are many other psychological stresses that everyone deals with. Family problems, lovers’ quarrel, and many other personal problems tend to develop emotional stress. It is a known fact which most of us have experienced; a mentally and emotionally fit person lives a happy life. These mental stresses decrease the person’s efficiency to work. Making the mind to flicker, they also increase the anger level in a person. All these negatively affect the person’s well-being and so must be removed. Massaging in your free time helps achieve this. Massages also develop the feeling of positivity making you capable of achieving your goals. Medical studies say these reactive thoughts are the number 1 reason for sudden heart attacks. Hence it is necessary to remove them before they adversely affect our health. To do so, two options are suggested, first, is regular meditation and the second is regular massages. These massage chair helps you to achieve mental fitness. Massage chairs are designed keeping in mind the human neurological system. Furthermore, it will free the mind from worrying thoughts increasing the overall health. Over-stressed body and fatigued mind are to be blamed for the behavior compromised that people in stressed kind of situations experience. Calming down ones-self is necessary and the method most of such people adopt is massaging. Just get off quick and enjoy the Powermax Fitness massage chair. The difference in the behavior will obviously be observed. Massaging takes away that stress and fatigue out of your body, completely nullifying any irritation within you. Regular massage therapy will help keep the mood fresh and will also develop a positive feeling. With pollution levels increasing all around the world, many of us suffer from skin related problems. Girls, as their skin is more sensitive, often encounter skin pimples of irritation. To encounter all these skin related issues, massage treatment therapy was developed. The Massage chair is of almost benefit especially to the athletes and sports persons. Long work hours and hours of running the games makes the body stiff. After every rigorous activity, it always is necessary for them to stretch out in order to relax the bodies. Massaging in order to relax the muscles is a common practice which is being increasingly used nowadays. One major issue that people generally have is that they don’t find time to go to a spa and get a massage as they are all very busy every day and it’s really inconvenient to travel to a spa and this mentality stops their thought to go for a massage due to this kind of inconvenience. But there are many popular massage techniques that are used worldwide and some of them are discussed below. Shiatsu is a Japanese word which means “finger pressure”. This is a traditional massage therapy that was developed in ancient Japan, based on the Chinese chakra medicines. In this type of massage, the pressure on the pressure points is applied by fingers, for about 8 to 10 seconds on each point. The systematic action of the treatment activates these pressure points, helping in the flow of energy throughout the body. Even though there is no scientific evidence of Shiatsu massage having any medical significance, the therapy is the most pleasant one. People who try the shiatsu massage often remain relaxed after the treatment. Though Shiatsu massage has no significance in advance medical, it is very popular as the pressure treatment of Shiatsu massage removes all the stress and tiredness which gets built up in the body. The massage increases the blood circulation so that more oxygen is delivered to various body parts. The result is the energy flows throughout the body without any hindrance. Shiatsu massage is also a popular treatment in a sports field. Therefore sports personal often undergo regular Shiatsu massage therapy in order to revitalize the body. Besides it, sportspersons often injure or spam their muscles. In such case, Shiatsu massage immediate relieves pain and relaxes the affected muscles. For the people who have anxiety or depression issues, Shiatsu massage is suggested as it calms the body, hence stabilizing the emotional and mental imbalance. It relaxes the body, removing the stress build-up and tension. Shiatsu massage is also suggested to patients having slip disc problem. Shiatsu massage is provided as an immediate treatment to stiff neck, shoulder and back pain. Shiatsu massage helps your body to relax, helping people suffering from sleeplessness and insomnia. Shiatsu massage also helps refresh the moods and also helps in the treatment of cold, cough and other similar respiratory problems. Swedish massage is the most common and well-known massage in the west. Popular in Europe and in America, Swedish massage uses long strokes, circular and kneading moment of hands to relax the body. The Swedish massage therapy performed by the professional therapist generally involves applying a thin oil or lotion on the body. Research studies done suggest that a regular Swedish massage treatment for about 40 to 45 minutes help lower the hormonal level, decreasing anxiety. Studies also imply that the treatment helps increase the blood circulation and also increases the white blood cell count in the blood. This helps in strengthening the body’s immune system. Swedish massage treatment is well-known western relaxation and stress-relieving therapy. For most stressed out people, Swedish massage is more of a recreational activity. Swedish massage, tones the body muscles, stretching them and applying a pressure knocking sequence. The Swedish massage therapy is done with long pressure strokes of hand in the same direction as the blood flow. This increases the flow of blood. Even in the sports field, Swedish massage is popular, with cricket, soccer and football teams employing a professional to give treatments to its players. The benefits of Swedish massage involve both physical and emotional well-being. The Swedish massage is a remedial measure to relax the muscles. Increasing the circulation of blood is another and one of the most important benefits of the Swedish massage. Swedish massage is a very important tool for muscular and chronic pain-relieving treatment. Releasing mental stresses is another benefit of the Swedish massage. Usually, Swedish massage is performed with application of oil or a lotion, which basically acts as a cleaning agent. The Powermax fitness massage chairs provide most of the above benefits like relaxing muscles, relieving stress and pain-relieving treatment. You can all get it just by using this massage chair at home with no one’s help. Our muscles are formed of many muscular layers. When the deeper layers and the connective tissue between the muscles and nervous system are where the problem resides, then deep tissue massage is the therapy that is needed. Deep tissue massage targets the chronically deep muscular layers. Deep tissue massage uses the techniques similar to the other massage treatment, the difference being that the Deep tissue massage involves strokes, knock and vibrations in slow motion and the applied pressure is also more and mainly concentrates on affected regions. The increase in the pressure helps the massage therapy to reach sub-layers deep in the muscles, especially to the connective tissue. Many of us suffer from various injuries in the lifetime. When injuries occur, they get penetrated deep inside the muscular tissues and can also result in damage to ligaments. These ligaments are the connecting tissue with adheres our muscular layers to the bone. Such cases require instant and intensive treatment before the damage becomes permanent. Deep tissue massage is prescribed as an optional treatment by most of the doctors to the patients suffering from such kind of injuries. In Deep tissue massage, the concentrated pressure applied researches the deep ligaments and thus toning them. As a result, the damaged tissue acquires an increased regenerative healing ability, repairing itself. Thus, with the help of this massage therapy, such chronic injuries can be treated efficiently. Deep tissue massage has gained a reputation as an alternative to allopathic medicine in the treatment of chronic and deep tissue pain. Deep tissue massage mainly focuses on the area to be treated, hence find useful in pain relieving, injury recovery. Deep tissue massage is also beneficial in treating strain and weakness in the muscles. Deep tissue massage is the best treatment to deal with the osteoarthritis pain. Sciatica, the constant pain in the leg or in the buttock region and excessive pain when trying to sit down or stand up, can be completely cured by deep tissue massage therapy. Deep tissue massage is number one treatment opt by the people suffering from fibromyalgia and related problems like; sleeping troubles, irritation in the bowel, headaches and also memory problems. Now, let us look at some modern massaging methods that are recently developed. Adopting some better technology, the Powermax Fitness Zero gravity massage chair are renowned top in its class. Let us see in detail about this Zero gravity massage chair. Zero gravity is a well-known massaging mode that was first developed in 2008. Zero gravity is that it is the position in which the astronauts sit in the launch vehicles when leaving the earth’s atmosphere, hence the name Zero gravity was given. During the launching, the rocket accelerated at a tremors velocity, which results in very high stress on the body. Therefore, it is required that the astronauts be seated in a posture such that the excessive force acting on their body leaves the without stress them. The models currently available, which will provide the best Zero gravity massages includes models PMC-2526, model PMC- 2386 L, model PMC-3386 L and the latest design in model PMC -4768. By using the Powermax Fitness Zero gravity massage chairs the body achieves a neutral position, which helps in decompression of the spine by taking off all the pressure from the spine and the vertebrae. In Zero gravity position, the force acting on the body due to its weight, instead of traveling through the spine, spreads across the body and onto the chair. Using the Powermax Fitness Zero gravity massage chairs, a reclined neutral position is achieved, at which the forcing instead of acting through the spine, gets distributed through the body. This Zero gravity massage therapy in turn also benefits the neck, back, and the lower back region by stress relieving them. The Powermax Fitness Zero gravity massage chair then actuates the acupressure points which regulate the blood flow. The overall result of this type of massage therapy is that the blood circulatory system becomes robots, becoming capable of meeting the future increases blood demand. The aim of theZero gravity massage chair by PowermaxFitness is to relax the overall body. When in Zero gravity position the muscles of the body relax and the stress-energy which gets accumulated in them is released. The effectiveness of the chairs by Powermax Fitness is reflected by the calmness of mind. With the entire body relaxed, our mind also comes to an emotional standstill position. The Zero gravity treatment helps bring the mind and the body together and gain a state of emotional and physical well-being. Most people suffer from insomnia, which is the case of sleep deprivation. Zero gravity treatment calms the mind, removing these unnecessary thoughts, fighting the problem of insomnia. The Powermax Fitness Zero gravity massage chair reclines the body to a posture which lowers the pressure on the respiratory diaphragm. As a result, the lungs are able to expand to their full extent. Deep breathing exercise performed in this Zero gravity position will increase the lung’s capacity, which in turn will help oxygenate more amount of blood. Varicose veins mainly form in our legs are accompanied by veins enlargement. As our legs lie below the level of the heart, the blood in veins in the leg has to flow against the gravity to reach back to the heart. This results in the veins becoming enlarged and twisted which are called as varicose veins. 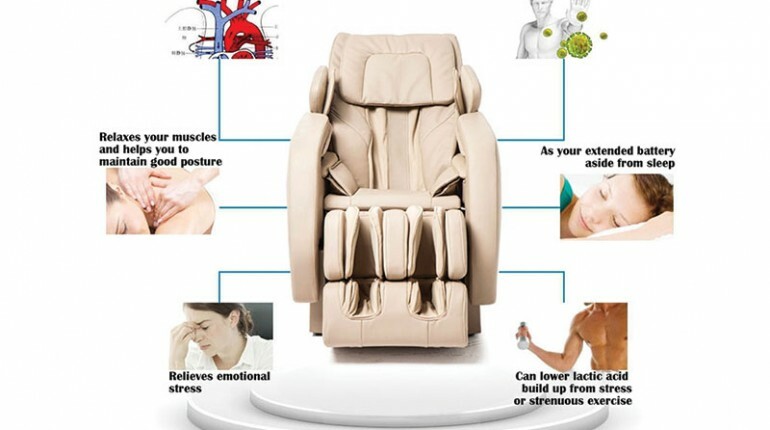 Zero gravity massage chair by Powermax Fitness involves the leg being raised above the heart level; therefore the flow of the blood in the veins back to the heart becomes easy. The result is the reduced amount of stress on the leg veins, hence preventing varicose veins. Achieving a healthy body is not just one day job. Our body is a delicate machine and as ever machine, it requires regular maintenance which If neglected will result in serious problems. With regular massage therapy and Powermax Fitness massage chairs, the body can be maintained in a top-notch condition.